The Persian Gulf: an amazing area for traditional and popular music, though little has been written in English about its early musicians and intertwining 78rpm-era commercial recording industry. At least to those of us in the West, unless fluent in Arabic and deeply vested in the subject, it’s been a hidden history, even to specialized researchers or collectors. Not only were the recordings highly localized, it would appear they weren’t distributed much outside of the Gulf, therefore near to inaccessible. Also, it seems that early 78rpm recordings in the region were made in fits and starts, not really gaining true traction until after WWII. But music from the Persian Gulf, often labeled generally as khaleeji music (Gulf music), is not typical classical Arabic music – it has influences from India, Coastal Kenya and Zanzibar, and the countries on the opposite side of the Gulf, such as Iran. Normally, you won’t hear the embellished, refined singing or virtuosic improvisations that you would hear in classical Arabic music, nor the highly orchestrated, mid-century sounds of the great Middle Eastern entertainers. This is rhythmic, driving music with a hard-picked oud and hypnotic beats – and today’s example is khaleeji music personified. Moza Khamis was from Oman, specifically the Al Batinah region, near the border of the Emirates. Sometime in the 1950s, she immigrated to Bahrain with her family, and possibly began her recording career there, singing Omani music. At some point, she recorded music for a small label called Bahrainphone, and apparently recorded extensively for a Qatari label known as Khalediphone. She died around 2010. This track, the title of which translates to “You Tantalized Me, Oh Dark-Skinned Man,” was likely recorded in the early 1950s. It was issued on the Bou-Zaid Phone label based in Kuwait, with its label depiction of a traditional Gulf fisherman’s boat. Listen closely to the beginning of the track, and you’ll hear the announcement “Stwanat Bahrainphone…” which seems to indicate that it was originally issued on the Bahrainphone label. This sums up the small Persian Gulf industry perfectly: an Omani singer, recording Omani music for a Kuwaiti label, perhaps re-pressed from the master tape on another Bahraini label, then pressed in Pakistan at Gramophone Company’s plant in Karachi. Perhaps Bahrainphone had a relationship with Bou-Zaid Phone. This situation is pretty typical of a lot of Gulf 78s, if you’re lucky enough to come across them, and care to investigate beyond the labels themselves. Why it was like this, I’m not exactly sure. Before WWII, it doesn’t seem that any of the European recording companies thought to press discs of Gulf music until the late 1920s, and only a small amount at that – about 30 years after recording began in Burma, just as a comparison. The Baidaphone label, based in Lebanon, may have been the first, recording Kuwaiti and Bahraini artists around 1929. 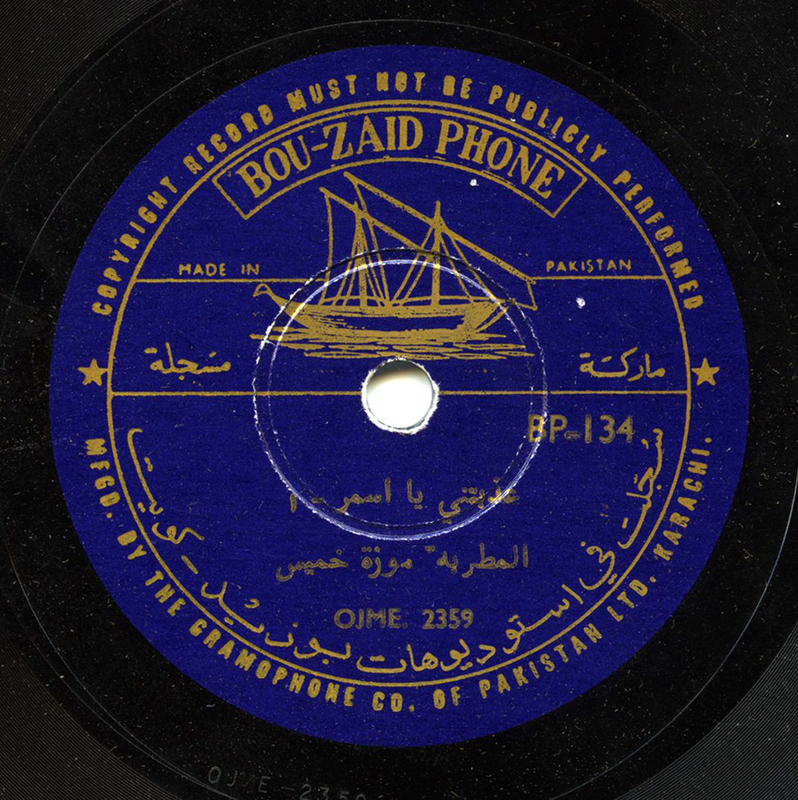 The Gramophone Company recorded several Bahraini artists as well (Mohammed Ibn Faris, Dahi Ibn Walid, and Mohamed Zuwayid, among others) around 1932 – extremely uncommon discs, but several were re-pressed on a now-difficult to find CD from 1994 on the Clube du Disque Arabe label, “La Musique de Bahrëin.” After that came Odeon, in ca. 1935, whom I believe also recorded in Yemen. The rest is spotty, to say the least. There was Jafferphon in Aden, Yemen, an imprint that aped the design of labels pressed by the Lindstrom conglomerate in Germany. Jafferphon was active in the mid-1940s. And the short-lived (but generally great) 1930s Syrian label, Sodwa, also issued approximately 10 discs of Gulf music. While practically invisible to most collectors in the West, the postwar years present an extravaganza of Gulf music on a swath of local labels – often, as I mentioned, repressed on different labels from tape masters, pressed in various locations (Pakistan, Greece, India, and even Sweden), and with all sorts of beautiful designs. Bou-Zaid Phone issued a lot of discs, but there was also Gurjiphone and Salimphone in Bahrain, there was Aden Crown, Shark, and Tahaphone in Yemen, Chakmakchiphon in Iraq issued Gulf Music, there was Ebrahimphone, Arabphone (not to be confused with the US-based label of the same name), Fadliphone, Queen Record, Emperor Record, Esmail Phone, Jawharah…the list goes on. And of course, the Euro labels got into the act, with HMV issuing discs of all kinds of Gulf music in the 1950s, and Odeon, too, but distributed locally and just as scant. These labels issued music from all over the Gulf – Yemeni labels recorded Kuwaiti and Saudi artists, Kuwaiti labels recorded Bahraini and Omani artists, Bahraini labels recorded Emirian and Qatari singers, and so on. There was even a bootleg label with a poorly recreated “Odeon” design. This is another reminder that before the advent of the 33 and 45 rpm record, 78s were virtually everywhere, providing people with their local music. They were the primary sound carrier of the 20th century for much of the world, and their global history is still being written. A big thank you to Rheim Alkadhi and Alfred Madain, for lots of helpful information. More info came from various disparate sources, including the now semi-defunct Zeryab website, Michael Kinnear’s writing, and discussions with collectors Benno Haupl and Dave Murray, who has a great Gurjiphone disc on his site.